A return to league action this Sunday for all teams with Central Park Rangers visiting St Michael’s for the big game of the weekend (kick-off 1pm). Kevin Grogan has strengthened his squad with the signing of Kevin McPhilips whose father Tommy played for the Rocks for many seasons. 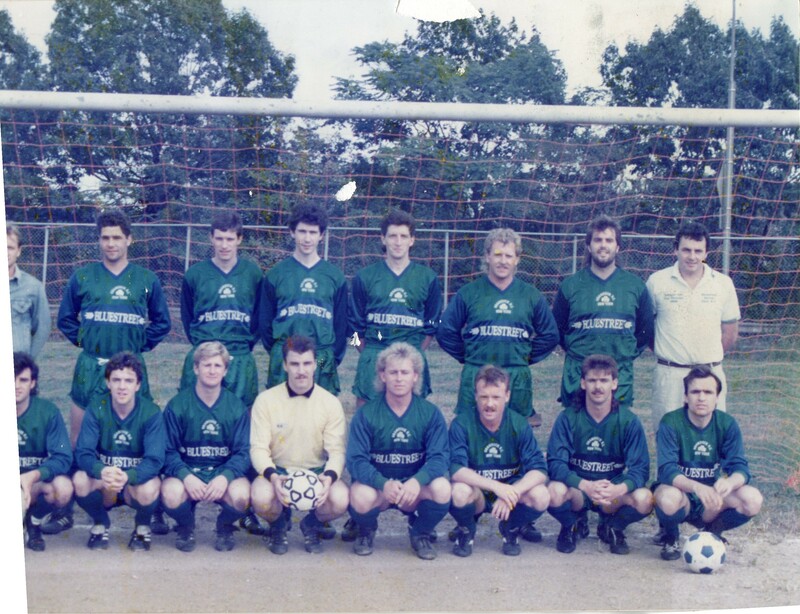 Thank you to Eltin Colma for providing the following two team photos – Tommy McPhilips is standing at the back row of this first one taken in 1989, second from right next to Mr Colman himself! And here is Tommy holding the football, front center. Photo taken in 1986. 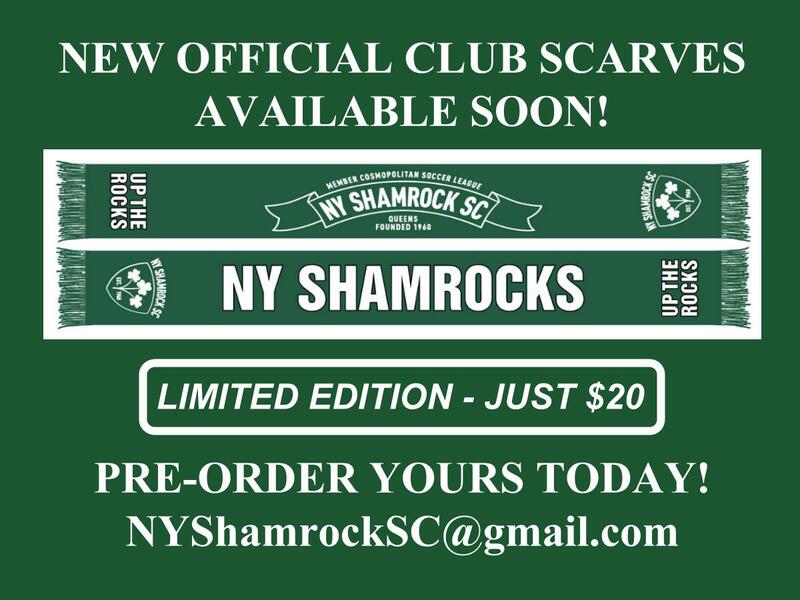 The Shamrocks are joint fourth after four games – level with Manhattan Celtic and United FC – while CPR are mired at the foot of Division 1. Not that Grogan will be taking any chances as he welcomes back four key players who missed last Sunday’s cup win against the Irish Rovers. Top scorer Christian Uy, full back Laurie Child (pictured), midfielder Sean Doran and Cameroonian shot stopper Frankie Tsasse are all available for selection while Lee Toland will just miss out, flying back in to New York from a trip home to Derry on Sunday. “I’m delighted to have signed Kevin,” said Grogan. 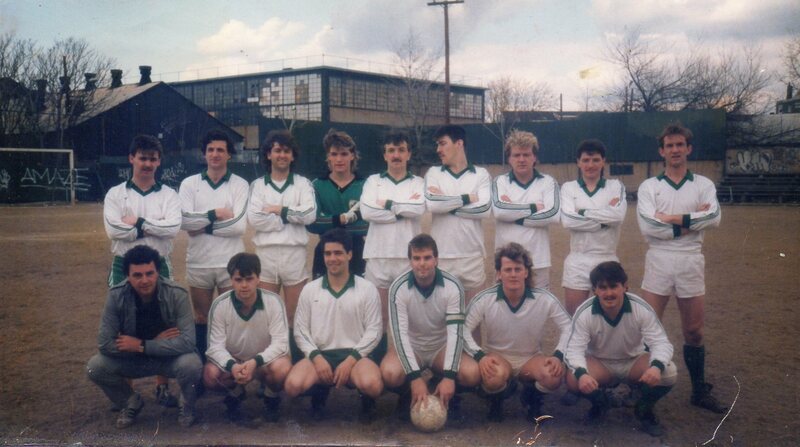 “Tommy is part of the Shamrocks lore and many supporters will remember him. Kevin has one of the best left foots in the country and has good experience at this level. CPR have yet to win this season, losing 3-1 to champions Lansdowne two weeks ago and exiting the State Cup last weekend at the hands of LISFL side East Hampton. Their reserves have faired a little better, winning two of their four league games and also coming into this weekend on the back of a 2-0 State cup win over Pancyprians. Rocks reserves coach Stevie Doyle is keen to atone for last week’s heartbreaking 3-2 defeat to Irish Rovers. 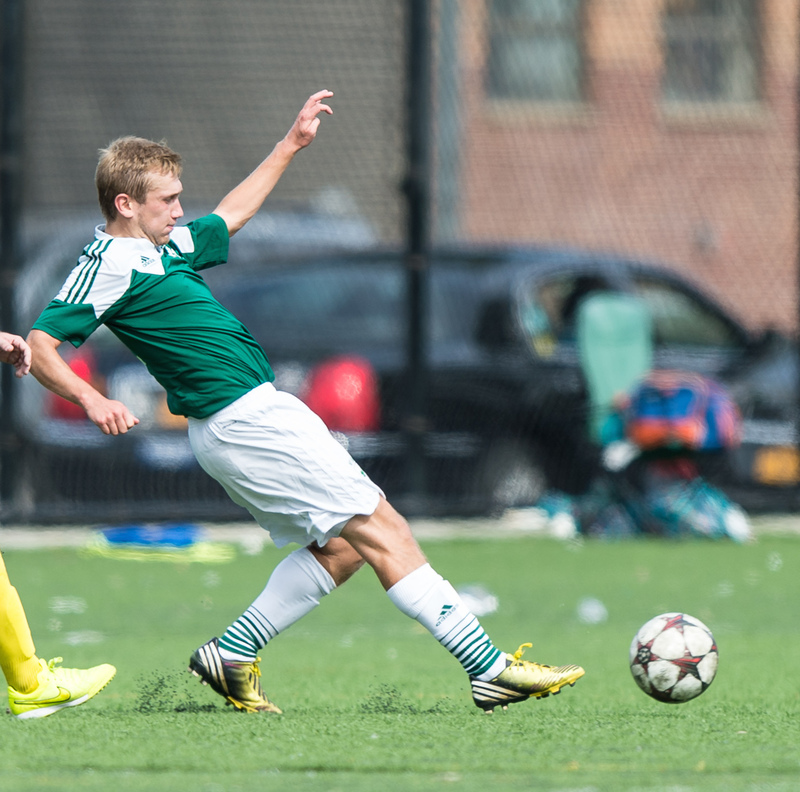 Meanwhile, in Metro 2, league leading Shamrocks 1960 face winless New York United in Red Hook Field at 11am. The Rocks Over 30s and Legends will be playing side-by-side at Randalls Island on Sunday morning at 8am in a unique clash of games. Paddy Mc Carry’s league champion Over 30s have only lost once in their last 23 league games and enjoy a two-point lead in first place. They will take on the winless Greek Americans on Randalls 75 with a view to keeping that incredible streak going strong. Meanwhile, next door on Field 74, the Legends have their first ever Irish derby with a game against Manhattan Celtic Masters. 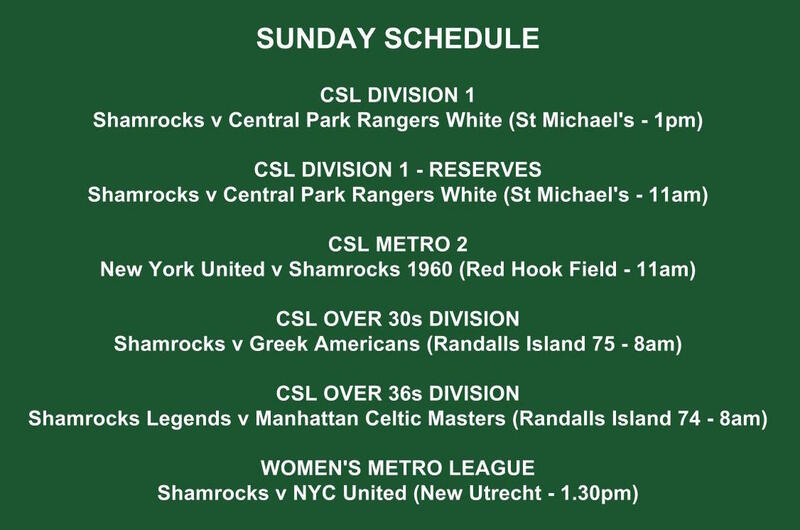 In the Women’s Metro League, NYC United will be attempting to bring a halt to the astonishing winning streak of the Rocks who are joint top of Division B (New Utrecht – 1.30pm). “This is the biggest game we have left before the Winter break,” said coach Paddy Geraghty.